It’s been another week of cool, cloudy and mostly rainy weather. It’s like some bad sci fi movie where all the inhabits of a city have been abducted by aliens while they slept and transferred to another city that looks just like the one they were stolen from except something is not quite right. In this case it’s the weather. The aliens gave us Seattle weather by mistake. While I rather like cool, I don’t like this constant gray rain. It’s starting to get on my nerves and making me a bit grumpy. Gardening this week has been almost nonexistent. The only time I have gotten to spend outdoors was for about an hour and a half yesterday morning. I did a tour of the garden to see how things were going and then did a fast weed of the veggies, herbs, and a flower bed in the front yard. At that point the clouds had rolled in thick and it was getting so humid it seemed like it might start raining any second. The garden is looking great. All the rain makes for lots of green. The only plants that are not happy are the tomatoes, peppers, marigolds and basil. These are warm weather sun-loving plants and they are barely holding on. The peas are going crazy though and so are the beans. The radishes look like I might be able to start pulling them in 1-2 weeks. The lettuce and spinach are growing well too though they are still too small to pick leaves from yet. It will be at least 2-3 weeks before I can consider nibbling on them. will have to knock a few off eventually once they get a little bigger and we can better tell just how many there are. Walter the crab has one apple that I could see. And Bea, the honeycrisp, I can’t tell yet if there will be apples. Fingers crossed! The really exciting thing though is Boo the blueberry. He is loaded, loaded, with tiny green berries. I wasn’t expecting blueberries this first year at all but I guess we will have some! Bookman and I are already planning the bird netting logistics. We do not want to share our blueberries. 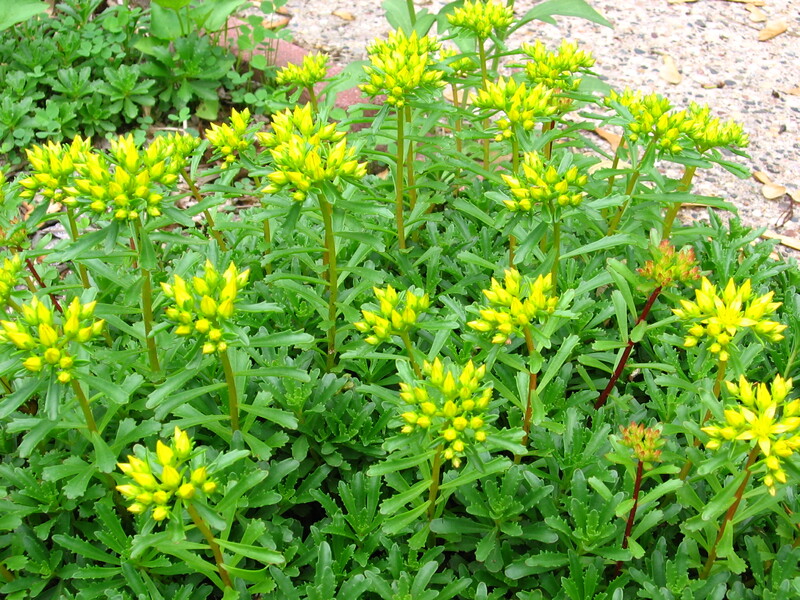 Blooming this week is creeping sedum, creeping baby’s breath, prairie violets, and anise hyssop. My camera decided to focus on the peas in the background instead of the flower in the foreground so forgive the blurry. 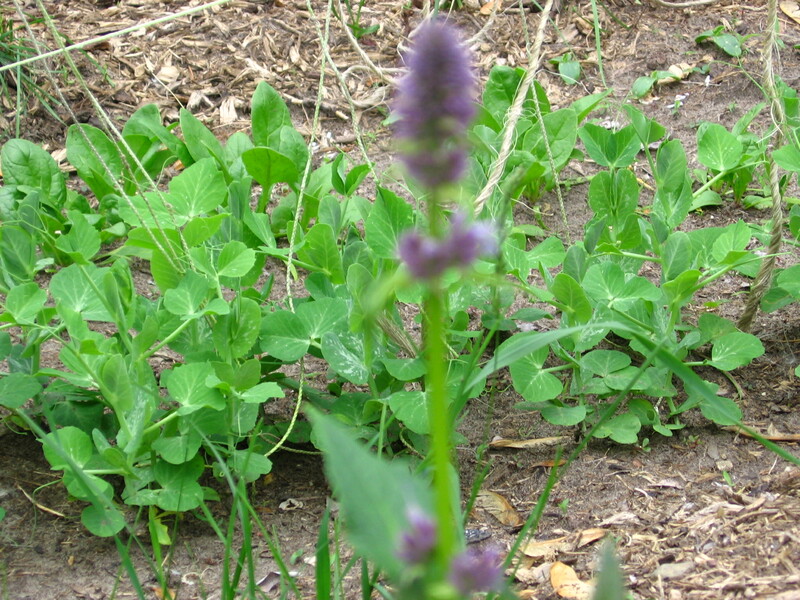 The hyssop is planted by the froggy solar fountain which is a big hit with the birds and the squirrels. I wish it wasn’t such a hit with the squirrels, but I don’t think a sign that says “birds only” would be much of a deterrent. Speaking of animals, I started reading a book from the library called My Backyard Jungle: The Adventures of an Urban Wildlife Lover Who Turned His Yard Into Habit and Learned to Live with it. Yeah, the title is a mouthful. I’ve not gotten far, but it is very interesting. He hasn’t spent much time in his own yard yet before going off to a town in Florida to get a tour of where the monkeys hang out. Yup, there is a city in Florida with wild monkeys. The monkeys are not native, they escaped from a privately owned entertainment park a very long time ago and have made themselves at home. It is weird enough seeing a raccoon out my window now and then so I can’t imagine what it must be like to have monkeys. Maybe I’ll learn how to get along with my squirrels by the end of the book. maintenance free even if I don’t want the honey. And call me dumb if you want, but I learned that honey is what bees eat over the winter. I had no idea. Commercial bee operations that take all the honey have to feed the bees during the fall, winter and early spring. So leaving honey in the hive would be fine. Not collecting honey though would eventually cause the hive to run out of room for the bees. When a hive runs out of room the bees swarm and the swarm usually splits in two with one half staying in the hive and the other flying off to look for a new home. It is also possible for the whole swarm to leave. So just leaving the hive to itself means the bees would probably fly off in a few years and leave the hive empty or significantly smaller. Plus, Modern beehives apparently, aren’t built very well and require upkeep and replacement every 3-5 years. I am better off just planting lots of things that bees like, one bee will tell the others where it found good food, and I’ll leave the bee hives for someone else to take care of. Sorry to hear your weather is still cool. I am hoping for you to have more sunshine soon and more good reports on your garden. boarding, from the forecast this morning it appears we will have mostly sunny and mid to upper 70s for the next several days. Of course it happens while I am work! But it will give the garden a nice boost! I’m actually enjoying that it has been cool around here. Not cold, but cool. For the first time in a long time it has felt like we have had a real Spring. Our garden is doing fairly well despite more rain than we probably need. Happy to have it over the drought, though. Love seeing the pics of your green thumb efforts coming to life. Carl, I love the cool, no complaints there, just the gray and the rain that gets depressing. You’ve had lots of big storms down in your area. It is good the drought is over. Hopefully it stays over! I laughed about “Seattle weather”. Here in my city we’d either say “Melbourne weather” or “London weather”. 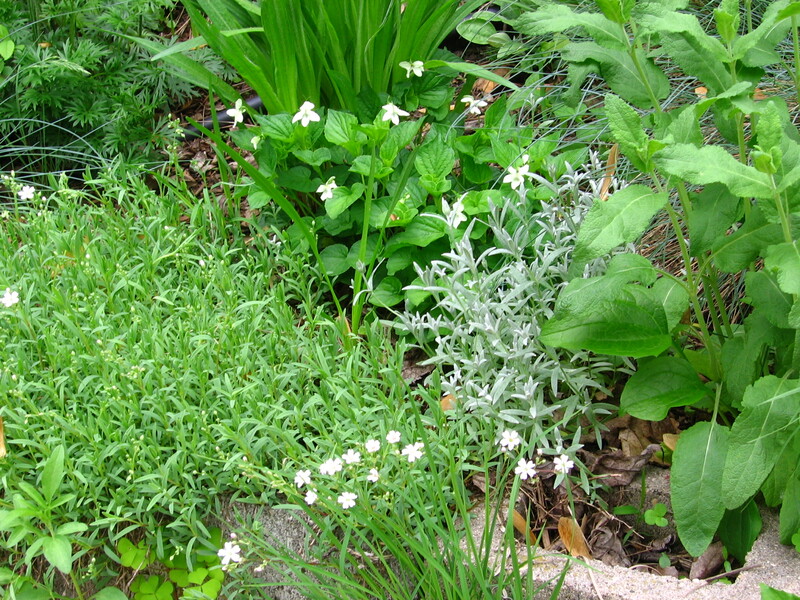 And rain does one good thing, I reckon – it makes weeding easier. At least it does here where out ground is pretty hard a lot of the time. Anyhow, your garden is looking great. whisperinggums, heh I suppose everyone has a rainy gray city that takes all the weather abuse 🙂 Yes, the rain does make weeding easier, that’s for sure! Something to be grateful for. And thanks, it’s coming along pretty well this year. Much better than last year’s heat and drought. Yes, until you wrote that, though, I hadn’t realised how universal it is! Heard on the news tonight “It was a bit of a Melbourne day today here in the national capital”. And it was. Cold, grey, miserable. Oh that is so very funny! I guess every country has a city that gets a cold, grey and rainy reputation! We have also some Seattle weather over here, so much so that it’s started to saturate the ground and rot the plants, not to mention how depressing it is. Perhaps you could talk to your neighbors about getting a beehive. We have several on top of the office building and there’s an assocation of beekeepers among the employees (but I’m too chicken-hearted and busy to take part). Seattle weather – lol! We had some lovely sun last week, but it’s grey and chilly again now. I’ve just gone round the supermarket and returned feeling distinctly cold! I’m amazed and a little green with envy at how much you’ve got packed into your garden. Ours must fit into your vegetable patch, I reckon! But at the moment the roses are glorious. 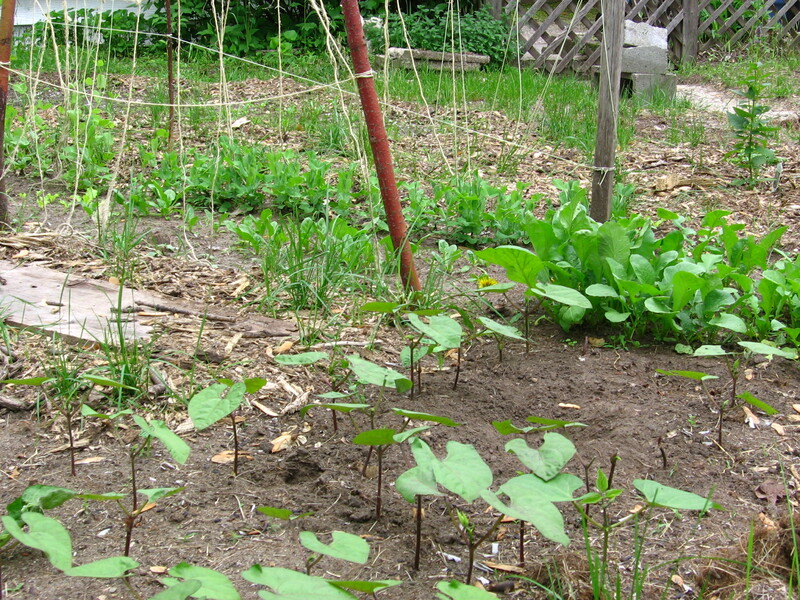 The veggies, well, not quite enough sun to get going properly, so I’ll cross my fingers for both of us, weather-wise! Litlove, it looks like this week we might get a good dose of sun and a taste of summer so next garden post I will likely complain about being hot! 😉 We pack things in here, front garden and back. Oh, I love roses! Sadly, your big English roses ala David Austin aren’t hardy here so I have major rose envy! You need one of those webcams trained on your garden so the updates would be instantaneous–woldn’t that be fun?! It sounds like yout crab apple tree is not just crabby but also grinchy–only one apple so far? And yum–blueberries–they are a staple in my diet and it’s so nice that now they are in season the prices. I wouldn’t share with the birds either…no matter how much I like birds. Just think of the yummy salad you are growing right now?! Danielle, heh, I could watch the squirrels digging and find out which cat continues to roll on my catnip! Oh the things that happen in the garden when I am not looking! Walter might have more crab apples but they are all very small and the same color as the leaves right now and hard to see. But he could indeed be grinchy. He’s still very young though so maybe it’s a teenage rebellion 🙂 We love blueberries too and the prospect of being able to eat them fresh from my own garden is thrilling. I am also very much looking forward to having a salad from my garden. I love that you name your plants! It’s been hot hot hot here (although is strangely cool today) — I have two tomatoes already! And have been harvesting cucumbers for about two weeks now. I’m an Oregon girl at heart, but this early-harvest thing is kind of awesome. wherethereisjoy, only the trees and shrubs get named, I’d be hard pressed to remember the names of everything if the perennials got named too! Tomatoes already? Wow! And my cucumber plants are only about 2 inches tall yet, if that!